Sony was one of the major device manufacturers who came to IFA 2015 hell-bent to impress the crowd. So the Japanese company unveiled not one, but three smartphones including the Xperia Z5, Xperia Z5 Compact and Xperia Z5 Premium. The three models are built on a common blueprint and once again Sony chose to rely on the controversial Snapdragon 810 platform to power its new devices. But the thing is, the previous Xperia Z3+ flagship also came with a Snapdragon 810 on the inside and soon after the device began shipping out to customers, we started hearing reports of overheating. Sony tried to do some damage control and rolled out a software update meant to minimize the troubles, which didn’t turn out to be working too well. So even before the Xperia Z5 family went live, we were saying that Sony better have come up with a solution to prevent the Snapdragon 810 from doing what it knows best. But the folks at Phone Arena who got to play a little with the new devices captured the image above. The phones exhibited on the grounds at IFA 2015 might be non-final prototype models, but even so it seems they aren’t Snapdragon 810 problem free. As you can see, the unpleasant “Camera will now turn off temporarily to cool down” message has popped up on the display during some fugitive, preliminary testing. It’s worth mentioning that the camera wasn’t used to record demanding 4K video that can cause the phone to run hot. Apparently, the Xperia Z5 was running very hot, although reportedly not as hot as some earlier Xperia models. At this stage, it seems that Qualcomm and Sony haven’t yet managed to resolve the problem concerning the overheating issues of the Snapdragon 810. The question is, can they be resolved at all? Sony is yet to start shipping the first units of the Xperia Z5 family (in the UK they are due out in November), so maybe, just maybe, the Japanese device maker still has time to do something about this ever-persistent problem. In our view, Sony’s decision to go for the Snapdragon 810 was a bad call and given the company’s current state, it’s hard to picture they will be able to manage another disaster in terms of sales. 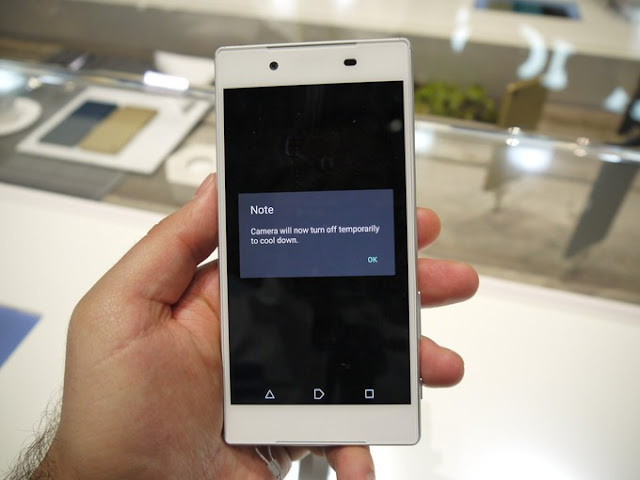 Sony Xperia Z5 still plagued by overheating issues?